Our team of Year 6 girls, STEAMA 6, have progressed as one of the four NSW Primary School finalists in the Tech Girls are Superheroes competition. As part of the competition, the girls used Design Thinking to find a problem in their community and developed a solution that included a business plan, an app and a video pitch. 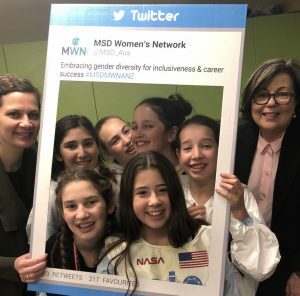 The students decided to take on the challenge of changing the statistics of women in STEM (Science, Technology, Engineering, Mathematics) fields, starting with shaping the minds of Primary students at Emanuel. After working with their mentors through several prototyping cycles to develop their characters, improve their app and design their business and marketing plan, STEAMA 6 was launched.